Copyright: he images remain the property of the author and POPCAP requires a license to use the images in relation to the competition and promotion of the competition only. 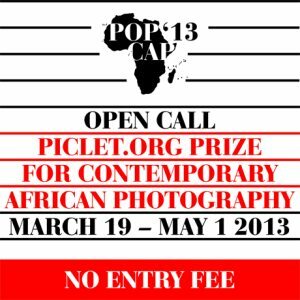 POPCAP is a prize for contemporary African photography that is awarded to photographic portfolios dealing with African themes. Submissions will be judged by a panel of seventeen internationally-sourced judges, with the winning entries publicly exhibited before and during Art Basel 44 and at PhotoIreland 2013, and the winner’s photographic collection presented in European Photography magazine. Sumbit visual narratives comprising between 10 and 25 images, and must relate to an African theme. Entrants may enter only once and to one category only. Online submission of digital photographs via the website. Image requirements: JPG format; minimum of 1500 pixels in width/height at 72 dpi and no more than 3 megabytes in size.? Should your work be chosen for exhibition, you will be asked to supply high resolution files that are appropriate for print. No borders or watermarks.